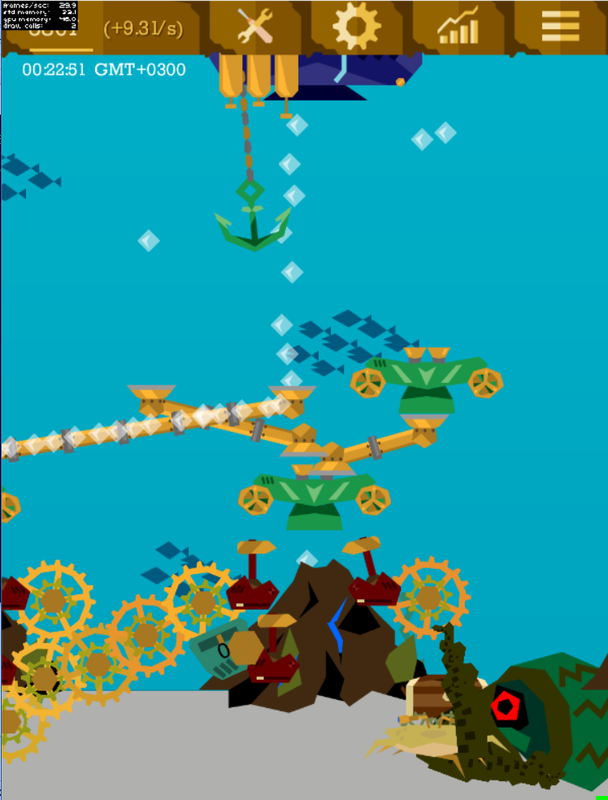 Airapport: 20 000 Cogs under the Sea: beta testing started! 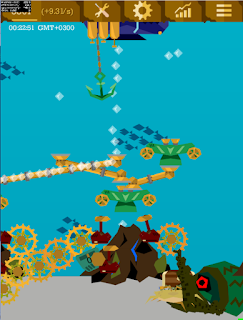 20 000 Cogs under the Sea: beta testing started! The Underwater world is out! You can get the game on Google Play from your mobile device, or play from your computer at Kongregate. The Underwater world was the most requested addition according to the poll, which was run in the Steampunk Idle Spinner community on facebook. The primary cycle of your economy is formed with 2 elements: an underwater volcano, which produces bubbles when touched and your submarine base: it converts oxygen into money. The first purchase is the hammer. It hits the volcano automatically. Then you'll be able to connect a cogwheel to it. By spinning the cog you'll be able to empower the hammer in a great way and increase your earnings. To let the cog spin automatically, while the game is in the idle phase, you can connect a clockwork engine to it. Tapping on the engine increases its charge and it begins to work faster. The charge depletes over time: be sure to check your marine steampunk contraption from time to time. Connecting several cogs in a chain increases the ratio of energy transfer. If you have a chain of 10 gear of 1:2 ratio, by spinning the first one you'll receive x1024 speed on the last one! You'll be able to become an underwater tycoon and millionaire! But there are much more sources of power on a seabed. Send a clockwork crab to scout for them! The cab travels left and right and eventually expands your view zone. To see, what's up there, upgrade your base. Over time you'll spot another volcano. Connect it with a tube to your base and start gathering more oxygen and producing more money! Next opportunity to grow your income is the Bubble duplicator. It can hover atop the volcano, the Tube exit or another Duplicator. It increases the bubble's value twice (or sometimes just clones the bubble). Octopus is the most bizarre underwater creature and they can serve you too! Just by extending their tentacles and spinning the cogs in their outreach. As you upgrade the Kraken, more tentacles will grow. And to extend your view even more, build a Scout Submarines factory. The faster your spin the cogwheel, connected to it, the more submarines will be produced and the sooner you'll find out, what other marvels the ocean hides. The game engine was drastically reworked according to our community's requests. Now you can long-press on a machine to open the Move, Upgrade and Sell buttons. This is very convenient. All the interface buttons have tooltips to let you see what they are doing. The shop buttons are scrolled with swipes, also you can set the number of buttons lines. If something is working strange, please, send a report to the developer from ingame interface using your mail app. Thus you'll help the development of this game in a great way. The game has "Share a Screenshot" button, and the players started sharing their wonderful contraptions in the group. Show us yours! How do I use helium?